Do you like the Mercedes SLK but shun its clamshell convertible top? If so, then today’s Nice Price or Crack Pipe Crossfire might be up your alley, as it’s a traditional convertible. It’s also an SRT edition, which means lots of ponies. Let’s see if its price means lots of bucks too. Do you believe in magic? You know, pick a card, look the handkerchief is now a dove, make you feel stupid sort of stuff? If so, then you must have really enjoyed yesterday’s 2004 Audi S4 as it seemed the seller was trying to pull one over on us. That car had a lot going for it—a V8 engine, six-speed stick shifter, and all wheel drive being just a few of its bonafides. Unfortunately, it also had a convertible roof that was no longer converting. That was apparently stuck in the downward dog position making properly calculated mad dashes from underpass to underpass critical during the rainy season. The ad brushed off this failure as a just a faulty sensor, but as many of you pointed out, the more likely culprit was far more serious and costly. Whatever the cost to get the car weather and rabid monkey tight again, that major mystery was the primary factor in the 62-percent Crack Pipe loss you anointed the car’s $5,200 price. Fool me once, shame on you. Fool me twice, shame on me. Fool me a third time and you’re goin’ down sucka! Here’s an old one for you: How do you pronounce DaimlerChrysler in German? Give up? You pronounce it Daimler, the Chrysler is silent. Ooh, crickets. Tough crowd. Yes, at one point in time Daimler AG, parent of Mercedes Benz, also called Chrysler among their adopted progeny. It sort of made sense. Daimler needed a lower-tier brand to generate volume sales and Chrysler needed to stay in business. At the time of the deal—back in 1998—it was called a “merger of equals.” The fact is however, the Germans didn’t really give a scheisse about how the Americans wanted to run things. The Europeans also didn’t really know how to run an American car company, and after bleeding cash for the better part of a decade, Daimler sold off their holdings in Chrysler to the amazingly evil sounding Cerberus Capital Management group in early 2007. Before then the German company gave America a taste of their previously available Sprinter commercial vans which we loved, and they opened up the parts bins for Chrysler which resulted in some E-class underpants for the 300C and Magnum, and a whole lot of SLK under the Chrysler Crossfire personal coupes and convertibles. Here we have a 2005 Chrysler Crossfire SRT-6 convertible in Aero Blue Pearl over black with just 73,000 miles on the clock. The SRT-6 part of that matronymic means that the car—which is pretty much all Mercedes Benz SLK under its Chrysler cross-dress—is also imbued with that German model’s AMG-level mechanicals. That’s a supercharged 3.2-litre V6, factory rated for 330-horsepower and 310 lb ft of torque, a five speed automatic remapped for more aggressive action, and a stiffer suspension made even more stiffy by rubber band-like tires. Frustratingly, those tires are different sizes—18-inch/19-inch front and rear. The Crossfire was built by Karmann in Germany on the hand-me-down R170 SLK platform. By the time of the Crossfire’s introduction, the SLK itself had graduated to the newer R171 platform. Thats served to distance it from its American cousin a bit. Only about 1,250 convertibles were sold in ’05, and a mere handful more left the dealers in ’06, the model’s last year. 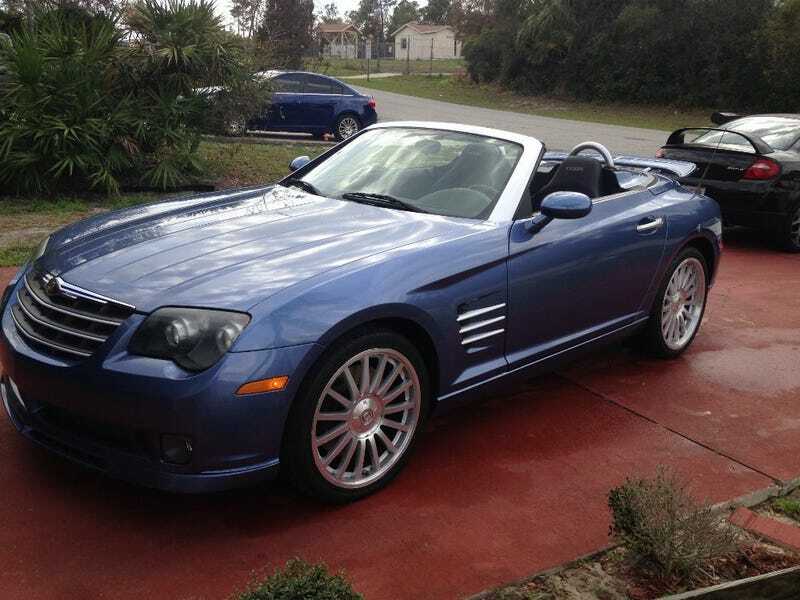 This makes the Crossfire convertible a pretty rare car. That’s even in comparison to the coupes, which I’ll bet you don’t see every day. A total of about 76,000 Crossfires in total were built. This one is claimed in its ad to so far have been in possession of three consecutive owners. During that time it lived in Washington State, and when purchased by its present owner, made the trek to Florida. That’s appropriate since for some reason, these cars look totally Florida. It sports new BFG tires, and according to the ad has seen some recent maintenance work completed, including the installation of a new drive pulley for the blower and a replacement pump for the air to water intercooler. The ad also notes that the body exhibits some dings, notably one right at the lip of the left-rear wheel arch. That’s annoying. It otherwise looks to be in decent shape, with a clean and seemingly mar-free interior. You might notice the crazy silver surfer that is the center console. That looks like cheap ‘90s electronics but it’s still somewhat sad to see the overall silver wave interrupted by an aftermarket stereo. The stock head unit would match the rest of that space in color and texture. One of the unique aspects of the SRT-6 version of this car is the enormous wing carried by the bootlid. That’s pretty ostentatious and somewhat incongruous when paired with the Crossfire’s odd retro styling. Still, it’s factory so its part of the family. Oh, and the top seems to work just fine here. The title is clean and the price is $12,999. You now need to decide if this rare German-American specialty car is worth that. What do you think, could this rare car command that $12,999 asking? Or, does that price make you want to stay out of the line of this Crossfire? AutoTrader out of Daytona, FL, or go here if the ad disappears.